Twitter is a micro-blogging service that allows you to publish short updates of up to 140 characters. You can follow other users to subscribe to their updates. All updates from users you follow appear in your own feed, so it’s easy to see them. If you already have a Twitter account, skip ahead to Exploring Further. If not, follow these easy steps to get one set up. Go to http://twitter.com/ and use the sign up box to get started. Follow the steps to create an account (if you want more help, Twitter provides detailed step-by-step instructions). You may want to think about your online presence when you decide on a user name. Do you want to be consistent across your various accounts? Once you have created your account, you’ll be taken to your Twitter homepage where there are further steps to work through to get you started, e.g. updating your profile to include a short biography or adding a profile picture. You can come back to these steps at any time using the link to Settings in the top right corner of the screen. We recommend you leave the privacy box unchecked so that others can see your tweets and communicate with you. Now post your first update! Click on the status box on the top left where it says ‘Compose new Tweet…’. Write a comment – maybe something about your participation in 23 Things. As you type you will see the number in the top right of the box decrease; this tells you how many characters you have left. Leave enough space to add the hashtag #oxengage at the end. This is the hashtag for the Engage and 23 Things programmes and will allow others to search for all #oxengage tweets. Once you’re done, click ‘update’. You’ll see your tweet appear in your timeline. Search by name or twitter handle in the search box. 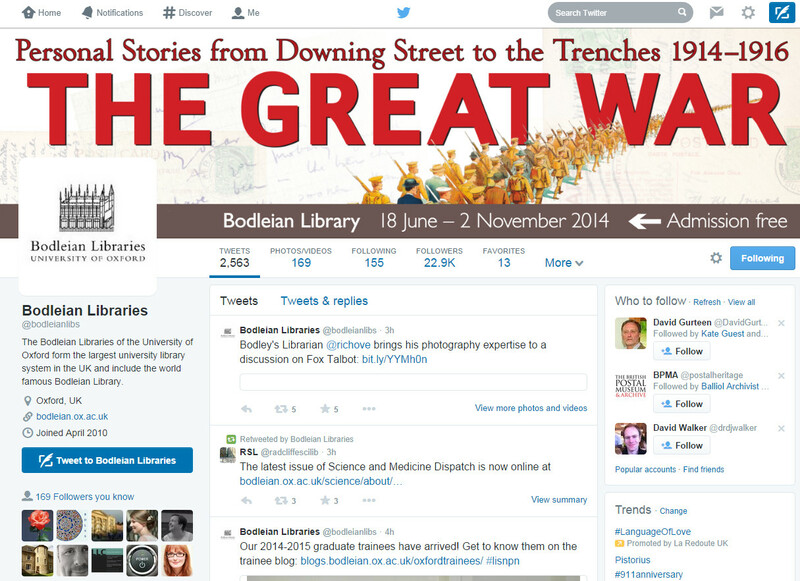 Try looking for and following @bodleianlibs and @ltgoxford. There’s also a follow button on every user’s profile page. Twitter hashtags offer a great way of following conferences – either by finding out about and interacting with those at a conference with you, or by hearing details of a conference you were unable to attend. Take a look and see if a conference of interest to you has/had a hashtag, and then see what sort of tweets come up under that hashtag (keep in mind that Twitter may not show results before a certain date). Another way to use hashtags is to set up real time chats – for instance, the Guardian Higher Education chats each Friday, or the #phdchats on Wednesdays. These are usually held at specific times each week or month, and you can participate by tweeting your comments or questions with the appropriate hashtag. Take a look at the tweets around last week’s Guardian HE chat (conveniently on academic blogging – search for #HElivechat) or #phdchat to get an idea. There’s an open Google doc that lists over 300 live chats and their dates/times; they cover all sorts of topics. Set up and save searches for relevant topics, people or events in your field. Take a look at a few Twitter clients. Tools like Tweetdeck and Hootsuite allow you to schedule tweets ahead of time and track retweets, reach and other stats. Think about Twitter and how you think it may or may not be relevant to you. Do you feel it’s useful? Why or why not? Tag your post ‘Thing 6′. This entry was posted in Thing 6 by Alasdair Watson. Bookmark the permalink.